After spending three months in the US, I personally think that I am able to determine what are my favorite burger places. Ok, I haven’t been everywhere in the country but I went to Chicago last month, I also visited Toronto and I have been in Indianapolis for a while. The american food has not a good reputation in France: however, it’s possible to try another places, different from fast foods. I admit it: fast foods are a part of the culture. 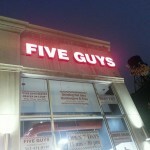 I have never seen so many of them: Taco Bell, Subway, Wendy’s, McDonalds, Burger King, KFC and many more! But I don’t have american friends who enjoy going there. Indeed, they would rather go to other burger places than to fastfoods. 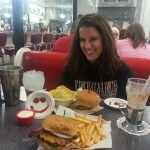 That’s why I can today let you know my burger places’ ranking. My number ONE. I will love it unconditionally. I have never tried something like that. They don’t propose many choices of burgers but it is almost the only weakness. The flavor is wonderful: you get what you pay for! 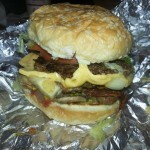 It’s a little expensive for a burger place (25$ for 2) but I think Five Guys offers the best burger a man can eat. Order online, by a phone call or directly, this place is perfect! I beg FG to come in France as soon as possible! 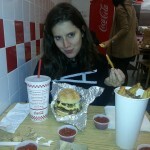 Five Guys’ restaurants are located in all states (normally!) in the USA. 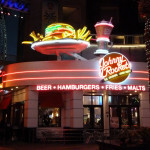 Johnny Rockets is an american franchise with a special concept: creating a very classic American atmosphere, like in the 50′s. Fries are always unlimited and from Mondays to Thursday, some huge burgers are only 5$! My advice will be simple: try their Milk-shakes!! They are so amazing (the Chocolate Vanilla twist is my favorite). 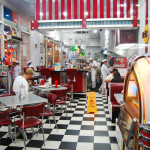 The restaurant proposes many offers a wide choice of burgers. The brand has been developed internationally except in Europe. The only european restaurant is located in Germany (in an american military base..) Sorry guys! 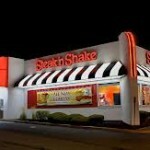 The third place goes to Steak’n Shake. This famous american franchise, created in 1934, is almost 80 years old.. It obviously has a strong american reputation and I endorse it! 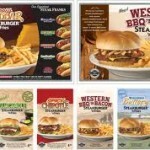 4$ meals are proposed and they are famous for their steakburgers. Restaurants are opened 24 hours a day, with happy hours from 1 to 5 am/pm. 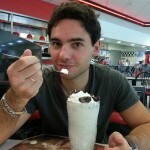 I was a little disappointed by milk-shakes: there was too much ice in it. If you have the opportunity to try one of them, let’s do it! You won’t regret !